Energy Bow Guitar, Virtual electric guitar from Binary Music. Binary Music releases Energy Bow Guitar, a new sample library for Kontakt 5 featuring the sound of a Stratocaster played with an e-Bow. To create this library, Binary Music used a Fender American Standard Stratocaster equipped with a Seymour Duncan ’59 humbucking pickup for extra sustain and played it with an e-Bow. The sampling was made chromatically in drop tune between D2 and A5 and the recording performed in 24-bit / 44.1kHz through an Inward Connections Vac Rac 4000 preamp. 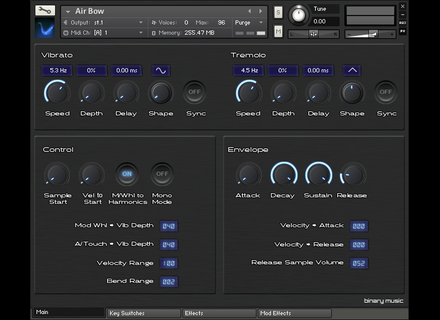 The Energy Bow Guitar library features 1GB of downloadable content, with three round robins per note for the Clean, Character (clean sounds with noises that can be selected via the keyswitches) and Harmonic (with which you can create crossfades by using the modulation wheel) samples, release samples are also included. You’ll also find tempo-syncable LFOs to create vibrato and tremolo effects, reverb, delay, amp simulation, phaser, flanger and rotary effects, as well as a Sample Start Offset feature to delay the starting of the sample via a dedicated knob or velocity. 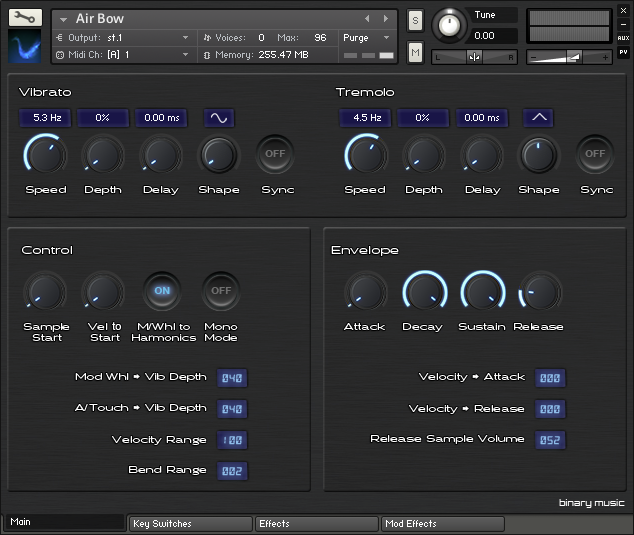 Energy Bow Guitar requires the full version of Kontakt 5.3.1. It is available for 20€ / $23 / £17 at www.binarymusic.co.uk. HorNet launches the Pro version of Sybilla Sybilla Pro is an enhanced version, with expanded functionality, of the HorNet de-esser plug-in for Mac and PC. Friday’s Freeware: Matthieu Brucher Matthieu Brucher, a young software developer, released this week two plug-in for audio processing on Mac and Windows. EDIT: [NAMM] First info about Notion 5 The PreSonus booth at Summer NAMM 2014 is full of surprises, and visitors will have the opportunity to discover the first images of Notion 5.